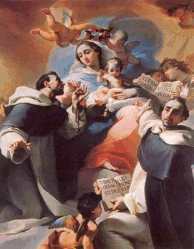 Early History of the Rosary :. The 5 Decade or Dominican Rosary is the most well known and widely practiced form of Rosary, the one to which almost everyone refers when they say "The Rosary". The name rosary means a circlet or crown of roses. Early in its development this prayer form was also know as "saying the paternosters" or praying the "bedes", an early English word that meaning prayers. So the very word "bead" is bound up in the development of the prayer of the Holy Rosary! Popular Catholic tradition relates that the Rosary was given to St. Dominic, founder of the Order of Preachers, in a vision. However, the actual devotion evolved over centuries of prayer. In the early monastic traditions, in order to fulfill the dictum to "pray unceasingly", monks made use of "the prayer book" of the Bible, the Book of Psalms. Typically the 150 Psalms of the book were divided into three sets and said at Morning, Midday and Evening prayer, 50 Psalms at a time. This was a practice of learned men, however. The much more numerous uneducated faithful, in a desire to imitate the pious practice of their more educated brethren, recited repetitious prayer in a similar fashion. This was most usually the "paternoster" or Our Father. In order to keep track of the number of repetitions various methods were used. Some would gather up 150 pebbles in a bag and toss them away as they prayed. Over time knots in a length of rope or bit of shell or strung beads begun to be used. By the year 1128, we know for certain that members of the Knights Templars were required to say certain numbers of "paternosters" in place of an office.